The Frigidaire 20.5 cu. ft. Upright Freezer allows you to conveniently store all of your favorite frozen foods. Adjustable Temperature Control ensures your food stays fresh. With the Frost-Free Operation feature, you'll never defrost your freezer again. four wire shelves, one removable trivet and six door racks to help you organize your frozen items. Is the finish smooth or textured? The door is smooth and the sides are lightly textured. Freezer makes a loud whistling noise, is this normal?? Once the freezer door is closed it makes a loud whistling noise. Just purchased this model a couple of days ago. I asked an associate...and they could not answer my question. Managed to look the issue up online, and there are several people saying that their freezers were whistling also....and one was actually a different model number. Any help is appreciated. How long do I need to run the freezer before putting in food items upon new purchase? you will know by two ways, 1. you insert a temp gauge and when the inside temp goes below 30 degrees, 2. you put a shallow pan of water inside and wait for it to freeze on top. yup, you could have thought of that too! What does&quot;garage ready &quot; mean? Is it to loud for indoor utility room use? It refers to the fact that it can be operated in a lower temperature environment, most refrigeration products do not do well in lower temp. environments as it can affect the thermostat ability to know when to turn unit on. 20 cu. ft. 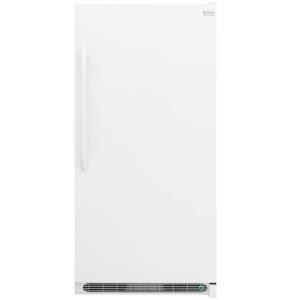 Frost Free Upright Freezer in White, ENERGY STAR is rated 4.6 out of 5 by 2862. Rated 4 out of 5 by ColdDragon from This is a follow up review, reducing our rating from a 5 to a 4. We purchased this freezer in J... This is a follow up review, reducing our rating from a 5 to a 4. We purchased this freezer in July of 2017. In February of 2019 (approximately 1 year and 7 months later) it quit working. We checked the obvious things and contacted Frigidaire to see if we could set up service even though it was out of warranty. To our surprise they offered to put it back under warranty for $116.85, for three years and to provide service under a Parts and Labor concession between the time of the call and the warranty going into force 30 days later. We were very pleased with this. However, we were told that a service rep would call us. They did not and when we called back to Frigidaire, we were told we needed to call and make the arrangements ourselves with a third party, and they provided a number. We called that number and the earliest they could get someone out to look at it would be nearly three weeks later bringing the total down time for the unit to four weeks before someone even looked at it, much less repaired it. I will write another follow up after the service. Rated 5 out of 5 by dhca37 from So far, so good! Crossing fingers Too soon for a good review as this was only delivered 9/25/15. The reason I'm cautious is that I had a new Whirlpool last year that began to ice/frost up on inside of door & that was a horror story. I kept having to chip the ice away often. I'm expecting more from this freezer. This freezer has no baskets & that's the reason for only GOOD on features. I saved the freezer baskets from my older freezer that "bit the dust" and they fit perfectly, sitting on the shelf. in addition to the other baskets, I purchased a few plastic ones that keep same items together. The door is too strong to open if you have to go back in just after closing it. Just wait a few seconds & it opens easily. There is a green light on bottom/front that indicates that the freezer is running. I do glance at this light often to keep check on it. Has lots of door shelf space. I'm praying that 6 months from now I can give the same GOOD report as that's a lot of money to spend on an item if it doesn't perform as advertised. There were a couple of dings on the outside that I noticed after it was delivered but it's out of sight so no big deal. Rated 4 out of 5 by MikeH from Works great. No problems so far. Big inside and can... Works great. No problems so far. Big inside and can hold a lot of stuff. Good buy. Rated 1 out of 5 by Anonymous from Worst product and HD doesn't stand behind it. I have been a long time HD customer. I bought this freezer and filled ith food 1 day after delivery. Didn't check it again for 3 days. After all I purchased it for long term food storage, not daily use. When I opened all the food was spoiled and it was not running. Still had owner but stopped running. Called HD to replace it. They refused and said it had to be done within 48 hours. Frigid airs also refused to replace but said they would repair under wRranty. I said if it needed repair then it was really a refurbished unit. Believe me I went up the management chain at HD and was repeatedly told, I agree with you, this is terrible and I would be upset too, but sorry this is their policy and they can't do anything for me. Repairman came out, can't figure out what's wrong but said they will try replacing the thermostat and see if that works and they will send "closed unit repair person out" to see if they can figure it out. Don't make this mistake. Rated 1 out of 5 by KS from We had this freezer for 2 weeks, 2 WEEKS, and it completely quit cooling. The entire thing had to... We had this freezer for 2 weeks, 2 WEEKS, and it completely quit cooling. The entire thing had to be rebuilt. It took a month to get it fixed by the time they came to look at it and ordered parts, etc.Yes, it was covered under warranty, but 2 weeks? Just got fixed today so we'll see if it actually works. We lost probably about $300 worth of food and Frigidaire customer service was unwilling to offer any compensation for the loss due to their faulty product. Will never buy this brand again. PS: LG has amazing customer service if anything goes wrong. Rated 5 out of 5 by jamest from Nice choice for garage Our requirements, a simple, large upright freezer that is frost free and will be housed in our garage. I did quite a bit of research before buying this freezer and must say it fits the bill. First, it is large, over six foot tall and rated at 20 CF. It’s shipping weight is 240 lbs. It is fine to be housed in a garage that does not exceed 110 degrees F. The body of the freezer is textured and bright white. The door and handle are smooth and bright white, easy to keep clean. The inside is mostly plastic and bright white with wire shelves. It has a bright LED light on the inside at the top. It is not as loud as our old 27 year old chest freezer was but it does make an unusual whistling noise after you close the door. I have provided a simple demo video to help decision makers. The lock and energy star ratings are also a plus. Rated 1 out of 5 by UnFrozen from We purchased our freezer from Home Depot around early June of 2017. The compressor has now gone ... We purchased our freezer from Home Depot around early June of 2017. The compressor has now gone out. The freezer was kept inside, did not get damp, nor had temperature swings. An appliance tech who came out to diagnose the problem said that he wouldn't have expected a less than 2 year old Frigidaire to have a compressor failure, yet it did. The cost to repair, that we were quoted, was over $700. Until the compressor failed, it was a nice freezer. With the compressor failure, I have learned some things that I would do different. Read reviews, from unbiased sources. Get a freezer with an alarm. And don't get a Frigidaire. Rated 5 out of 5 by MomofFive from LOVE this freezer! I never thought I could "love" an appliance, but boy, this one changed that! ... LOVE this freezer! I never thought I could "love" an appliance, but boy, this one changed that! We bought this at a great price, taking the gamble with the large size as compared to a smaller model. The salesman was super helpful, and when I told him our family size, he agreed with me that it was a "go big or go home!" I couldn't be happier with it. Its got so much room, bright on the inside, great shelves both in the body and door, and it has an incredible seal that you can hear when the door closes. You can feel how tight the seal is and hear the door closing shut as it seals. 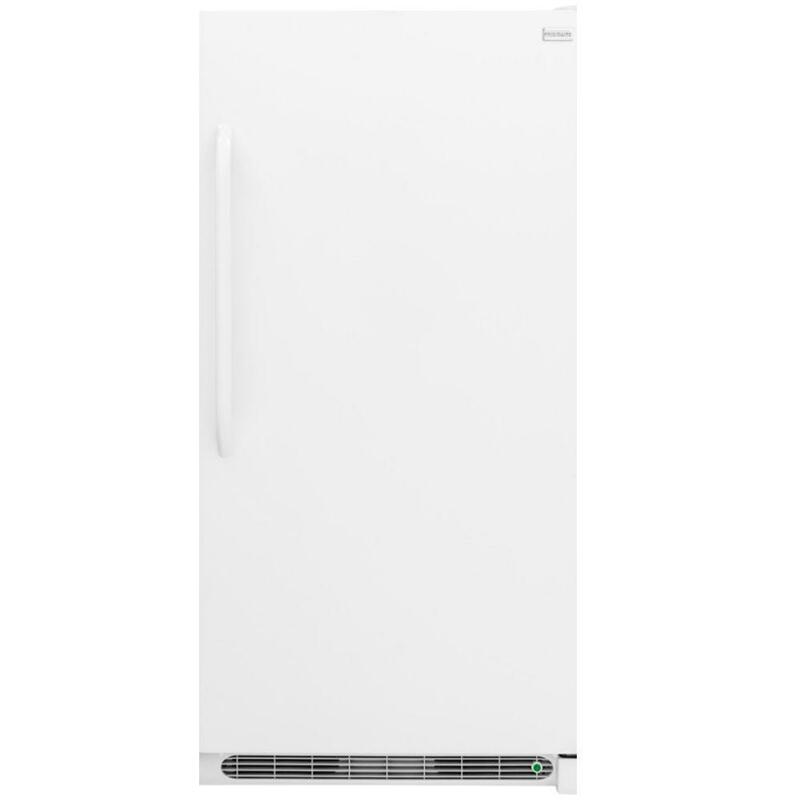 I am so, so glad we got this one.......we have had a chest freezer for years that has worked great, but the ease of opening this door and seeing everything inside is just so handy!